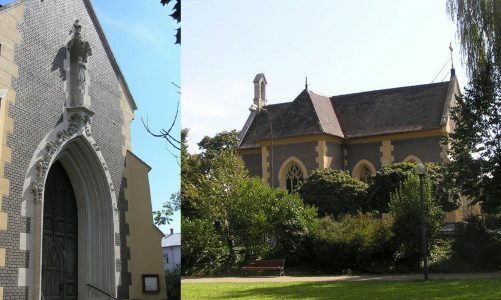 According to a plan of Jan Heidrich, the neo-gothic chapel was built in 1856 on the command of Aloys II, Prince of Liechtenstein, as a gesture of thankfulness for recovery from a serious illness. Comprehensive reconstruction of the chapel’s exterior and interior took place in the 1970s and 1980s, where a shabby plaster or stone components were repaired and replaced. The chapel is located in front of the train station park landscaping and was being primarily used by the German-speaking employees of the so-called North Road of Emperor Ferdinand (“Severní dráha císaře Ferdinanda”). Main reasons for the rail route construction were transportation of salt, coal, iron, food and military. The first train arrived to Břeclav on 6th June 1839, therefore the rail route has become the first steam-engine in our land. Until these days, the route serves purpose of so-called “second rail corridor”. After the bomb destruction of the Church of St. Wenceslas in the end of World War II, the chapel was used as a temporary sanctuary for local Catholic parish. Nowadays, the public access into the chapel is quite rare.